The Royaltone further explorers the possibilities of vintage English fuzz circuits in a dual-stomp format featuring powerful in-series 3-band tone circuit. 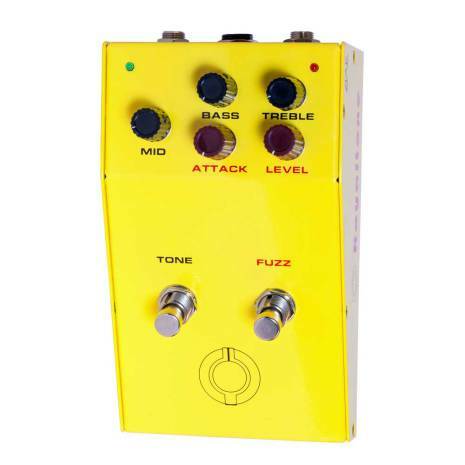 The Royaltone’s fuzz imparts an instantly recognizable spitting, buzzy grit that cuts right through even the densest mix. All Solid State design with 4 Bipolar, low noise transistors. Individual sections for High Frequency Boost and Fuzz; each section has true bypass foot switch. Sonically selected film, ceramic, mica, and electrolytic capacitors. Individual gain pots for each section. Fuzz section also has control pots for Juice, Bass, and Treble. Power: Single 9V battery; can be bypassed with external power supply and 2.5mm power jack - center Negative; battery need not be removed. Total Maximum current draw: <6 mA. Unit is powered when input is connected, whether LEDs are on or off. Remove plug from the input jack to conserve battery power.